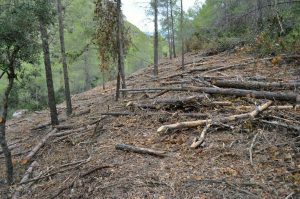 Forest actions aiming to protect them against high intensity fires by means of reducing fire loads in areas surrounding yew forests or in strategic management points (PEG). a) To prevent fire spreading to the crown. b) To reduce the behaviour of a fire that may come from another area. c) To facilitate the work of extinguishing the fire. Silvicultural measures aimed at reducing the fuel load and break the continuity of fuel in the perimeter areas of yew or at strategic points of management (PEG) will be performed. PEGs are key locations that determine the movement and final scope of a fire and allow extinguishing equipment concentrate resources in places that will provide safe and effective maneuvers of a whole wooded slope of the mountain. 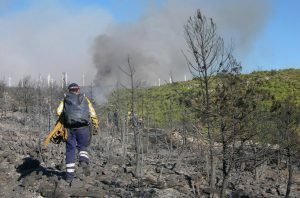 Combination treatment of partial underbrush clearing, pruning and thinning down, depending on the combustible material that is intended to be eliminated (surface, scale, air). Treatments always accompanied by grinding debris generated during forestry work. The detailed study has reduced the surface to intervene in Orri (1,5 ha) and Cosp (1,7 ha) to prevent the effects of a topographical fire. In Llaberia the action area it has extended to 22 ha between perimeter and auxiliary strips and strategic points of management. In Prades the action area it has extended to 11 ha. Forest fuels: fallen leaves, dray branches, dry logs (from 10 cm diameter).